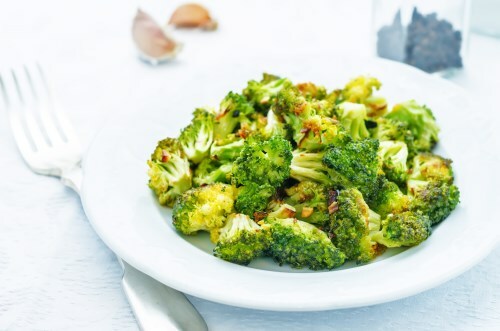 Toss broccoli and garlic together in a large bowl. Drizzle extra virgin coconut oil over the broccoli; toss to coat. Spread broccoli and garlic onto a baking sheet; season with onion powder, salt, and black pepper. Roast in preheated oven for 10 minutes, turn, and continue roasting until beginning to char, about 10 minutes more.